This one is the bipolar. Mean spirited or funny either way it looks yummy. 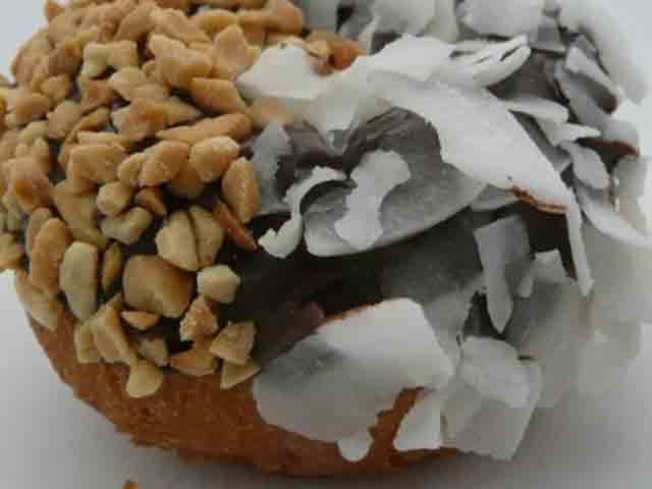 Campbell's Psycho Donuts is expanding to downtown San Jose. The team of self-described lunatics is setting up shop at Camera 3 on 2nd Street. So if you find yourself jonesing for something sweet with a crazy name you now have two destination locations from which to choose. The downtown shop is going for laughs for this week's grand opening event Thursday night. The comedy group ComedySportz is performing a little ditty they've titled, "Donut Stop Laughing" at the theater. Psycho Donuts clearly survived the early objections from mental health advocates that forced the extinction of flavors like "bipolar" and "massive head trauma." It even got a mention on the Today show this week as Hoda and Kathie Lee found themselves talking about desserts. The Campbell reference is about three minutes in the following clip.